Got tired of the dysfunctional Flixter Facebook app. Grading movies A-F. Only movies that I find interesting, but not necessarily high quality. Some blockbusters, some interesting rarities and oddities, and occasionally some turkeys. I've been waiting for this. A true turkey. 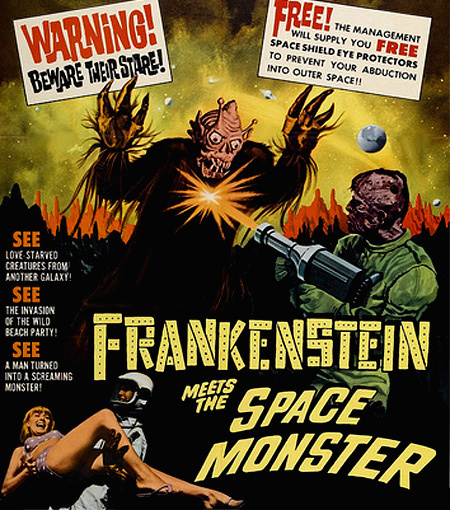 Frankenstein Meets the Space Monster was ranked number seven in the 2004 DVD documentary The 50 Worst Movies Ever Made. In their book “Son of Golden Turkey Awards”, Harry and Michael Medved awarded this film the Golden Turkey for “Most Ridiculously Inane Rock 'n' Roll Lyrics Used in a Motion Picture” for “To Have and To Hold” by The Distant Cousins and The Poets. The aliens shoot down the rocket that crashes in Puerto Rico (where else?). The android pilot is damaged and goes bonkers on a murderous rampage throughout Puerto Rico’s beach areas, populated by bikini girls. The evil Doctor Nadir is the mastermind behind the Princess’ evil plan to kidnap scantily dressed girls at the beach for “breeding purposes” (but of course) to repopulate Mars, with the help of the surviving Martians males (all five of them), in order to save the dying Martian race. Doctor Nadir in particular really loves his job, and it shows. A scene where the princess and Nadir inspect the first of the Bikini Babes is a small gem. The movie ends with a climatic ray gun battle at a cheesy beach pool party between the astro-robot and the Martian space monster. It is a bit unclear why the princess and Doctor Nadir brought the space monster with them, but it comes in handy at this part of the movie. While the fight between the astro-robot and the space monster goes on, the bikini girls make their escape from the spaceship. In the end the astro-robot blows up the Martian spacecraft and prevent another Martian invasion of Earth. Advisory: Bald evil scientist, lots of bikini girls, excessive use of scratchy NASA Mercury rocket and Korean war newsreel footage, extremely variable acting, reverb surf guitar music occasionally deafening at inappropriate moments, and aliens attacking dancing teenagers at a pool party. Some actor are trying to keep a straight face. 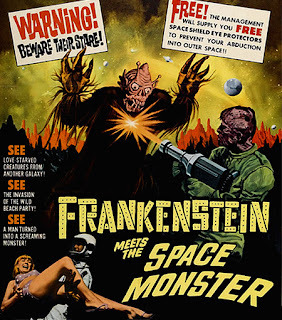 Frankenstein Meets the Space Monster rate an easy 10 on my Bad-Film-O-Meter.